SANTA CRUZ, CA—The University of California Regents today (Thursday, September 16, 2010) approved the appointment of Alison Galloway as campus provost/executive vice chancellor (CP/EVC) of UC Santa Cruz. The appointment is effective immediately. Galloway, a professor of anthropology, succeeds David S. Kliger, a professor of chemistry and biochemistry, who is retiring as CP/EVC, a post he has held since March 2005. As CP/EVC, Galloway is responsible for the day-to-day academic and administrative operations of the campus, including budget oversight, long-term planning, and advising Chancellor George Blumenthal. "This is a great day for the campus," said Blumenthal. "Alison Galloway and I have worked together in several capacities over the years, and we make a good team. She has deep roots on campus and in the community, and she cares wholeheartedly about the university and its students, faculty, and staff. She is the right person at the right time." "I want to thank Dave Kliger for nearly four decades of exceptional service to the campus, including the last five years as CP/EVC," added Blumenthal. "Dave has been a trusted colleague, and he has guided the campus through very difficult times. I congratulate him on his retirement from administration." Kliger plans to return to campus later this fall as a research professor of chemistry and biochemistry. Galloway brings considerable scholarly achievement and administrative experience to the campus's number-two administrative post. At the time of her appointment as CP/EVC, Galloway was also serving as vice provost and dean of academic affairs and University Extension. She has resigned both posts, effective immediately; an announcement of her successors will be forthcoming. "I want to bring an openness to the role of campus provost/executive vice chancellor," said Galloway. "I look forward to getting out of the office and talking with people. I want to hear the concerns of students, faculty, and staff." Galloway is also one of the nation's leading forensic scientists. She is frequently asked by law enforcement officials to analyze and identify human remains. Because many of the cases she works on are homicides, she has referred to her work as "giving voice to victims." She is a frequent expert witness in court cases. She intends to continue her research while serving as CP/EVC. Galloway joined the UCSC faculty in 1990. 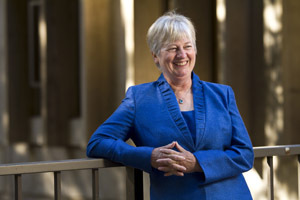 She has served as chair of the Anthropology Department, as well as chair and vice chair of the UCSC Academic Senate. She earned her Ph.D. in anthropology from the University of Arizona and her B.A. in anthropology from UC Berkeley.